Indian defense spokesman: India "is monitoring the situation closely"
ISLAMABAD, Pakistan (CNN) -- Pakistani troops have been moved to the Indian border amid fears of an Indian ground incursion, two Pakistani military officials told CNN on Friday. The troops were deployed from Pakistan's western border with Afghanistan, where forces have been battling Taliban and al Qaeda militants in North West Frontier Province and the Federally Administered Tribal Areas. 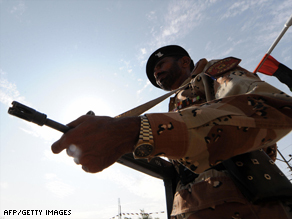 Pakistan's armed forces have been on high alert in anticipation of a possible conflict with India following last month's terrorist attacks in Mumbai, which killed 160 people. India believes the 10 men who carried out the attacks were trained at a terrorist camp in the Pakistani-controlled part of Kashmir. A senior official said the troops had been moved from areas where there are no active military operations, and emphasized that troop levels have not been depleted in areas where soldiers are battling militants, such as the Swat Valley and near Peshawar, capital of the North West region. In addition to the move, leave for all military personnel has been restricted and all troops were called back to active duty, the senior official said. Asked for a reaction to the development, Husain Haqqani, Pakistani ambassador to the United States, said, "Pakistan does not seek war, but we need to be vigilant against threats of war emanating from the other side of our eastern border." He said Pakistan's conduct since the Mumbai attack "has been consistent with international expectations. There is no justification for threats against Pakistan." "Pakistan is also a victim of terrorism and will continue to act against terrorists," he added. "We are a country of rule of law and need evidence to prosecute anyone for the crime of terrorism." U.S. National Security Council spokesman Gordon Johndroe said the United States has been "in close contact" with India and Pakistan in probing the Mumbai attack and fighting terror. He is hoping that "both sides will avoid taking steps that will unnecessarily raise tensions during these already tense times." In London, England, Pakistani envoy to Britain Wajid Shamsul Hasan countered the report, noting that winter redeployments are normal and that only police and not the army had their vacation canceled. While he criticized India's "coercive diplomacy" and regretted India's "war hysteria," he underscored the fact that the two countries don't want to go to war. Tensions increased between nuclear rivals India and Pakistan following the November 26 attacks in Mumbai, where militants launched a coordinated strike against luxury hotels, a Jewish center and other targets. India has criticized Islamabad for not doing enough to counter terrorism, and it has accused elements within the Pakistan government and military of complicity in fueling terrorism in the region. On Thursday, Pakistani Foreign Minister Shah Mahmood Qureshi warned India to refrain from launching any strikes against Pakistan, according to a report in The Nation newspaper. Another unnamed Pakistani military official told CNN that the Pakistani military has been taking precautionary measures to safeguard borders in the face of mounting military threats from India over the Mumbai attacks. "Naturally, you have to take certain steps to stem that expected tide of Indian operations," he said, "You can't fight on both fronts so we have redeployed certain military elements from the western border to the northern border to meet Indian operations." The official said that while Pakistan has tolerated U.S. missile strikes from Afghanistan into Pakistan, he believes the government and public would not stand for an Indian incursion. In the Indian capital of New Delhi on Friday, three military chiefs briefed Prime Minister Manmohan Singh on the security situation. An Indian officer said Indian soldiers have spotted Pakistani troop movements along the Line of Control in Kashmir. The Line of Control divides the disputed region between the area controlled by India and the area administered by Pakistan. Indian defense spokesman Sitanshu Kar said India isn't carrying out a troop buildup along its western borders but "is monitoring the situation closely." He also said he is "not aware" of military reports about Pakistani troop mobilization along the Indian border. "But we are keeping a vigil," Kar said. Since the division of the subcontinent in 1947, India and Pakistan have fought three wars, including two over the disputed territory of Kashmir -- now wracked by an 18-year, bloody separatist campaign that authorities say has left at least 43,000 dead. There also was a limited border conflict in 1999 between the countries in Kashmir.